If you know Pittsburgh, you know the implication of bridges. Not just that they close for repairs causing confusingly intricate detours or that they clog at rush-hour in a stampede of homebound yinzers, but the meaning in it all (even in the frustration) is that they are so very important to us. “City of Bridges,” we’re called. Built on industry and the treasures of the mineral-rich Allegheny Mountains, Pittsburgh is situated at the confluence of the Allegheny and Monongahela Rivers where they merge into the Ohio—the three rivers form a triangle, if you can imagine it. With 446 bridges at last count, “City of Bridges” is an understatement, really. We’re utterly dependent on them. The past year has been one for destruction, it seems: from the demolition of the Greenfield Bridge last December to the epic and nearly irreversible fire damage caused to the Liberty Bridge (in the midst of an $80 million reconstruction, no less). But the real threat to our everyday (in Pittsburgh and beyond)—detours and delays aside—has come from a not-so-concrete source: a certain president-elect’s campaign. Like many, I have spent the last few weeks in shock and horror. Not just because my candidate didn’t win, but because we have elected an unqualified, overinflated and narcissistic hatemonger. Whether he believes in the bigotry and intolerance himself is irrelevant. He used a group of people—the hopeless worn-out underbelly of this country’s dying industry—as a means to his own end by scapegoating, making impossible promises and inciting violence and hate. I won’t lie. I’m angry, fed up. I’ve deleted Facebook friends. I’ve ignored. I’ve blocked. I’ve holed myself up in a bubble, comfortable only at my local coffeeshop and my apartment (with my two smooshy-faced cats and my partner.) I’ve wanted to punch out family members, pelt eggs at signs, scream at the top of my lungs, ram into the car in front of me just for donning the wrong bumper sticker… but I know it won’t help, that I will just be feeding the thing I am fighting against. “I’m done being nice,” I’ve said, over and over. And I mean it. But what I mean is… I refuse to be quiet, to be passive, to let this be normal, to watch people I love be badgered or bullied. No, I won’t clock the conservative with the “Make America Great Again” hat in the checkout line, but I won’t shut up either. So I made a t-shirt. “Figure out a way to use your art,” said a wise man and fellow fixture at Biddle’s Escape, responding to the expression of my post-election helpless-hopelessness. I created the BUILD BRIDGES NOT WALLS design because I needed to do something. With the help from my friends and their realized dream, Tiny Little Monster, we were able to create a snuggly soft tee with a powerful message. The best part? 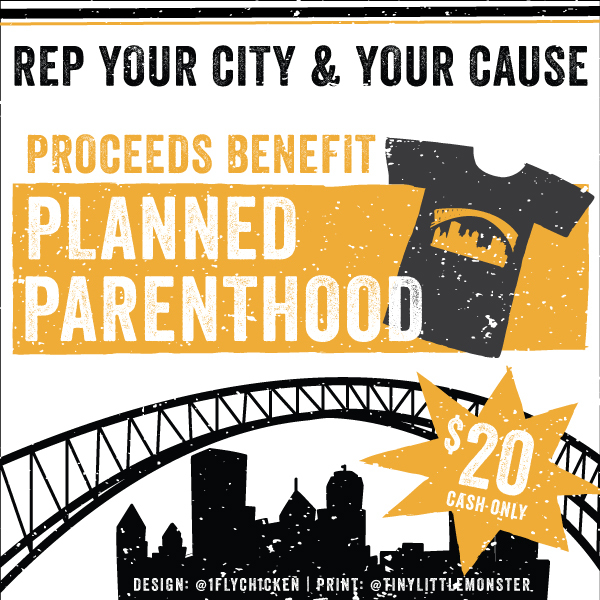 I will be sending all of the profits for t-shirt sales to Planned Parenthood of Western PA.
My hope now is that we’ll only get stronger from this division, that somehow this brigade of big hearts will triumph. Just as the Greenfield Bridge replacement takes shape over 376, just as the Liberty Bridge has been recovered from its near-collapse… we keep moving, we keep finding a way to the other side. 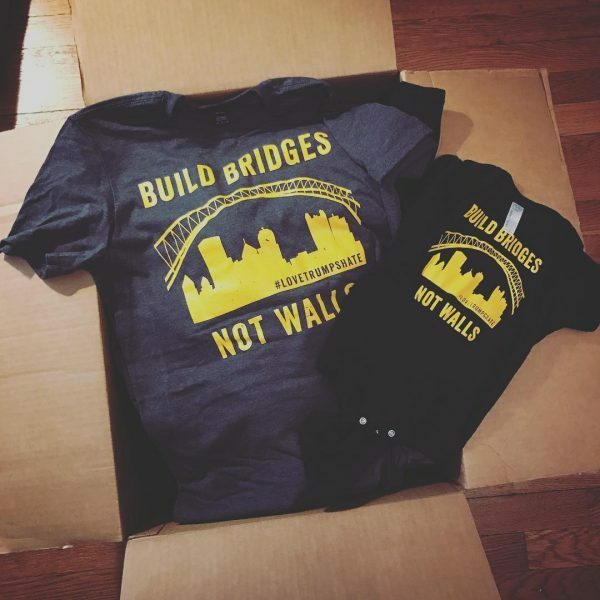 BUILD BRIDGES NOT WALLS shirts are available to pre-order online (shipping out February 7th) or drop by Biddle’s Escape in Regent Square to pick up a shirt and a French Toast Latte. For special orders or ideas, drop me a line. *Special thanks to Tiny Little Monster for their cause-loving discount which has allowed me to donate over half of the money from each purchase to the cause. **Also, a big thank-you to Joe Davis (a.k.a. Mr. Biddles) for believing in me and the cause (always). © 2018 (and beyond!) Meghan Tutolo. All Rights Reserved.